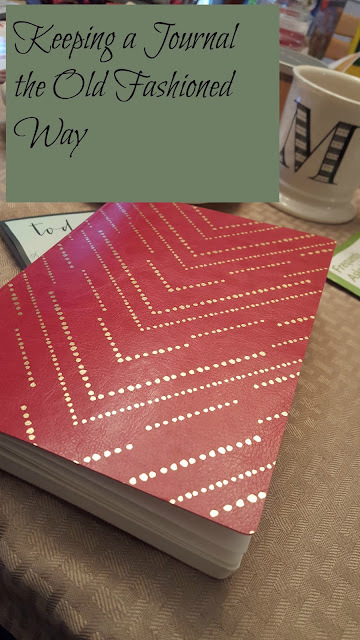 A few months ago, I started keeping a journal again. A regular old bound book of pages that I would write in. I started like I start most things. I wrote consistently for a few days, and then it fell by the wayside. At the time, we had a tiny bit of dance drama going on, and I was trying to puzzle a lot of it out without driving Adam or my friends crazy. Then I got busy or I missed a few days and because I hadn't yet made it a habit, it got lost. Then this past December I was clearing off my nightstand, and I unearthed that journal again. I read my last entry, smiling and shaking my head as you do when you look at what seemed like such a big issue at the time, but you'd trade your right arm to be dealing with now, and picked up my pen again. And now it's a habit. I'm so glad that it's a habit now. The more I make it a priority, to empty my mind every night before I go to bed, the more I like it. I was talking to a friend about it the other day, and she was surprised to hear that I was keeping an actual paper and pen journal. I basically replied that I'm a writer. I deal in words, and getting those words out has been a great routine to get into. Her face didn't lose the puzzled expression. "But you have a blog," she said. "Isn't a blog basically a journal? Why would you write something twice?" It's a good question, but it has an easy answer. I'm not writing things twice. This blog? Not the same as a journal. Not even close. To make it onto my blog, I plan out a topic. I take pictures and edit them (via picmonkey, and even if you're not a blogger, it's a GREAT site for editing). I find links. I write, and I read, and I edit. Sometimes I edit more than others, but I do edit. Then I publish, and I share, and I want people to read, because I want those thoughts out and public. I know what I want to say. My journal is private. And it's so different. It's not a coherent essay. It's a brain dump. Sometimes it's where I vent when I feel like my friends are tired of hearing it. I mean, let's be honest. Even my best friends have got to be tired of my mind circling around the same stressful issue. No one wants someone who is a fountain of negativity ALL the time. Sometimes it's a place to work things out. Most of the time, I can figure out what I need to do. Or say. Or whatever. But I need to get it out somewhere to see that. Sometimes it's just the mundane details that you might not care about. Writing a piece most parents can relate to? Sure. Writing about the specific mundane details of my day? Or the same thing five days in a row? No. Don't even pretend you care. It's hard to get a piece ready to publish, but a journal lets me get the words out immediately. Some of my journal entries do work their way onto this site. But that's after I've brain dumped them. And re-read them. And puzzled them out. And have something concrete to really SAY. It's a good example for Madison. Madison knows I have a journal. It's not locked up or hidden. Reagan...well, she probably knows, but doesn't really care. I've talked to Madison about respecting my privacy, but that writing, like reading, is good for our minds. And journal writing is pure WRITING. You can write in fragments. You can use crazy caps. And it doesn't matter. You just take those thoughts out of your brain and put them onto paper, any way you want to. Because she knows that I write before bed, she's taken to writing herself. I told her that if she wants to show me, it's fine, but if she doesn't, that's ok too. This isn't "school". Now it's a habit. And it's a good one. Every night, I take whatever has been swirling around in my head, whatever conversations that I've imagined, whatever I wish I would have said, whatever would be swirling around as I tried to fall asleep, and I take my my fancy pens (that I love above any other, and have a set for home and for my purse), and I get it out. As habits go, I'll take it.